Born in Toronto in 1965, Ducey was raised in Cambridge, Ont. 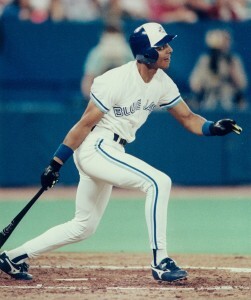 The left-handed hitting outfielder was signed as a free agent by the Blue Jays in 1984. After being named MVP of the Rookie Ball Medicine Hat Blue Jays that year, he rose through the organization’s ranks to make his big league debut on May 1, 1987. His first major league homer came on September 14, 1987 in a contest in which the Jays clubbed a big league record 10 round-trippers to defeat the Orioles 18-3. The talented Canadian suited up for parts of five more seasons with the Jays, prior to being dealt to the Angels in 1992. Tenures with the Texas Rangers, Seattle Mariners and Philadelphia Phillies would follow, as well as a two-year stint in the Japanese Pacific League with the Nippon Ham Fighters in 1995 and 1996 that saw him belt 51 home runs. He returned to Toronto for five games in 2000 and saw his final big league action with the Montreal Expos in 2001, making him the second Canadian (along with Denis Boucher) to start his major league career with the Jays and end it with the Expos. Ducey is also one of only four Canadians (Boucher, Shawn Hill and Matt Stairs are the others) to suit up for both the Jays and Expos. In all, Ducey played 19 seasons in professional baseball, making him one of just 12 Canadians to do so. Following his professional career, Ducey competed for Canada at the 2004 Olympics and served as a coach at the 2006 World Baseball Classic and 2008 Olympics. He has also been a scout for the Blue Jays, worked in player development for a Mexican League team and currently working in the Phillies organization. For season by season Major League Baseball stats click HERE.